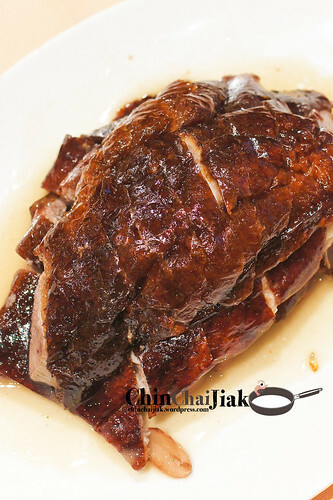 Yung Kee (鏞記酒家) is a multi-award winning restaurant that specializes in roast goose. 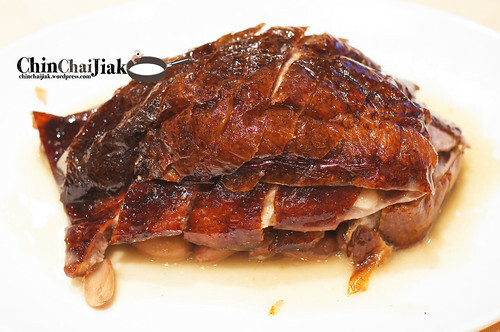 Together with Yue Kee Roast Goose (裕記大飯店), Yung Kee has a reputation of selling the best Roast Goose in Hong Kong. Although Yung Kee also has a reputation of selling over-priced dishes, it actually started from a humble background. It started off as a road-side stall (dai pai dong) in the 1930s selling roast meat. After some success, they moved to a shop in the 1942 and finally settle in the current location in the Year 1964. They built up their business steadily and it’s currently owned by Yung Kee Holdings Ltd, a company with more than HK$100 millions in asset. 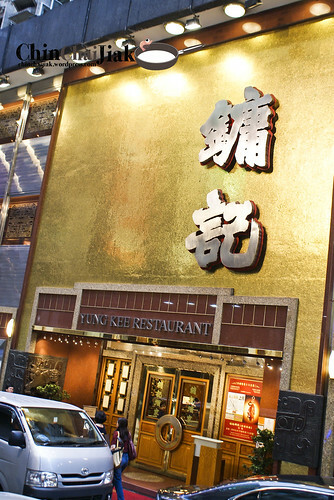 Yung Kee also received one Michelin star in the Year 2009, 2010 and 2011 in the Hong Kong and Macau edition. The posh ambience of Yung Kee. The service was great as well. 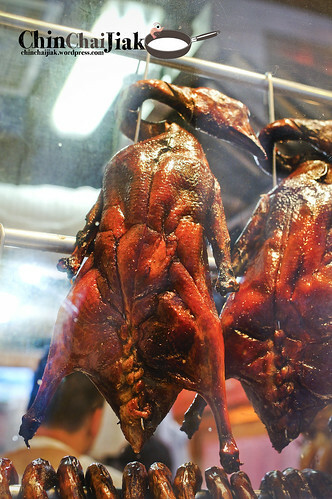 Although i already know of the exorbitant price of Yung Kee, i am just too curious on how does this infamous roast goose taste. The general advise that i heard is “Just order the goose and century egg and forget the rest”. Therefore, i decided to do the touristy thing to visit Yung Kee to try out this one of the top twenty restaurants in Asia. I have to emphasis that i visited Yung Kee in Year 2012. I didn’t have a blog then so i am only writing it now. Price of their Goose (2012). Click to enlarge. 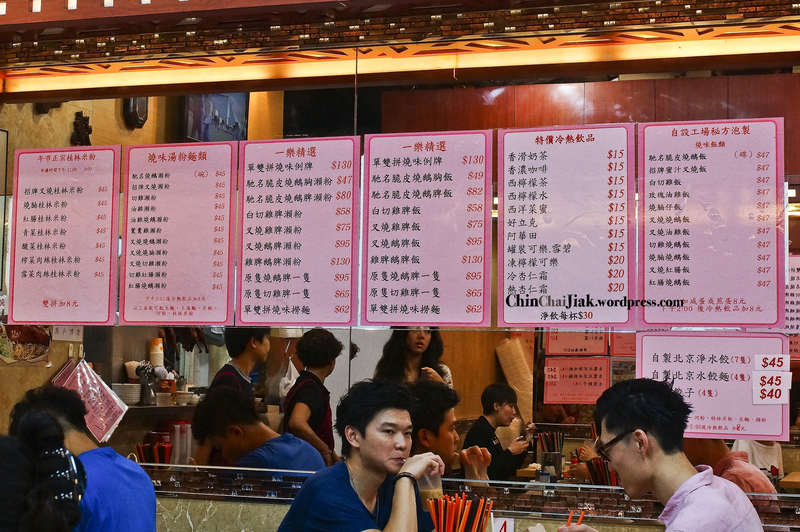 Unlike other roast meat joints that sell individual plate of Roast Goose rice, Yung Kee offers minimally a quarter of goose (lower quarter without drumstick) that cost HK$150+. 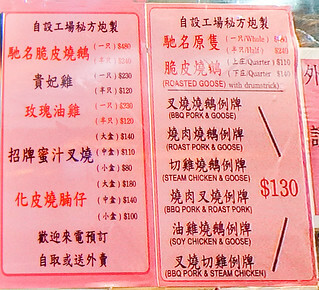 There are options of half goose at HK$240+ and whole goose for HK$480+. The small problem with ordering a quarter goose is Yung Kee only gives you the top quarter that is mostly breast meat. That’s not much of a problem for me as i’m a breast lover. Yung Kee goose is much more meatier and more succulent than a roast duck. The highlight of the whole dish is the goose skin. It is really crispy, almost crackling and the thin layer of oil and fat that comes along with it. It’s oily, but not greasy for my stomach. As it’s the breast (top) quarter, it is slightly drier and this problem can be solved by dipping their meat into the braised sauce that comes along with it. I thoroughly enjoyed the rich and savory flavours of the sauce, as well as the braised peanut that comes with it. Four of us shared this dish and we can’t get enough of it. Each piece of meat was snapped up swiftly and all of us agreed that it’s not as bad as what we read online. Yung Kee also sells Roasted “Jet” Goose where they vacuum pack their roast goose for you to “da bao” back to your country. Each goose costs HK$500. 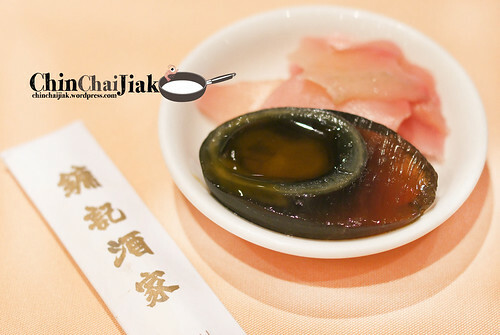 I am not exactly a fan of Century Egg actually but my friend told me she had the best century egg of her life in Yung Kee so i decided to see what’s the deal. In April 2014, my same friend visited Yung Kee with his family and said that the roast goose standard had dropped and they switch the braised peanut to some beans for their Roast Goose that don’t taste as good and the roasted goose skin don’t taste as crispy. Price wise, it’s still as expensive. 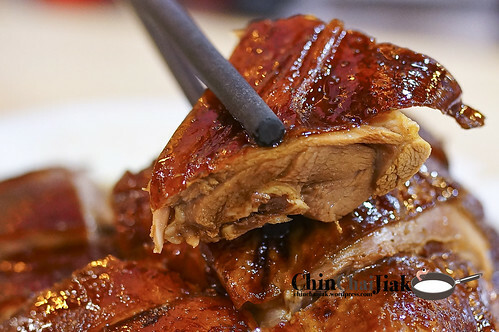 He tried the Char Siew and some other dishes and thought it’s still a good idea to just order their Roast Goose. 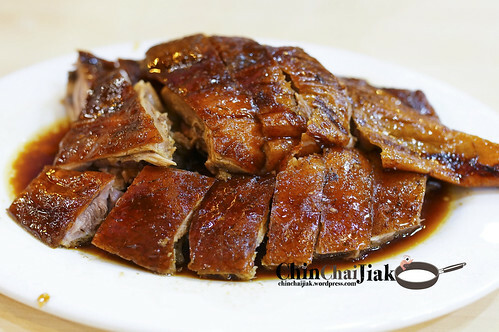 For me, i think there is a need to at least try the famous Yung Kee roast goose once regardless of the online bashing and i am glad that my visit in 2012 was a good experience. Although it was a little “paisay” (embarrassing) to only order a quarter roast goose and HALF a century egg with four people, at least we saved our pockets from burning a hole. Probably i will try to visit again in my next trip to Hong Kong to see if the food standard really “deteriorated” as per what some people had said. 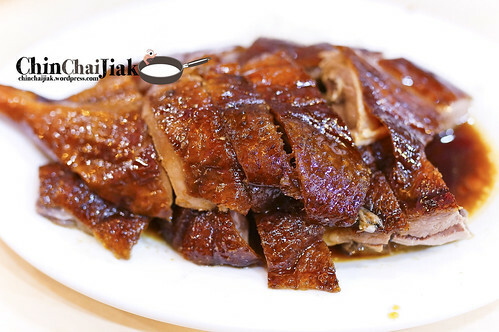 For friends who like to try a less expensive roast goose that is more welcomed by their locals, you may want to check out another of my post on Yat Lok Roast Goose. I had roast goose twice in Hong Kong. Once was bad, second time was good. 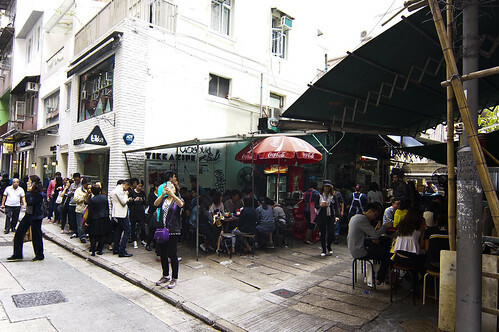 The second time was at the famous Yung Kee (鏞記) back in Year 2012. However, Yung Kee seems to have reputation of “for tourist” and “overpriced”. Therefore this time, I want to compare Yung Kee to a non-restaurant that serves good Roast Goose and see what is the actual difference. 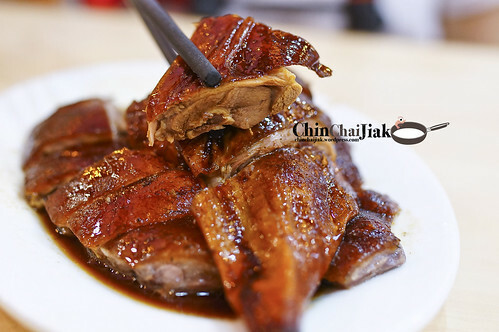 Although it was said that Yue Kee Roast Goose Restaurant (裕記大飯店) has the best roast goose in Hong Kong but it is quite inaccessible for this trip. 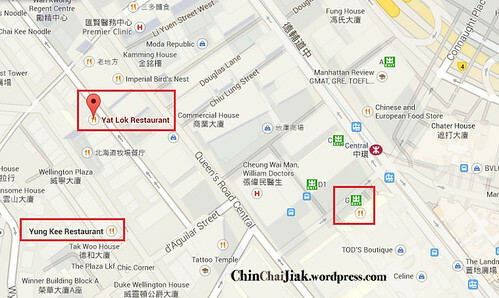 For those who are interested, here is their address at Sham Tseng: Sham Hong Road, 9, Sham Tseng, Hong Kong (深井深康路9號). 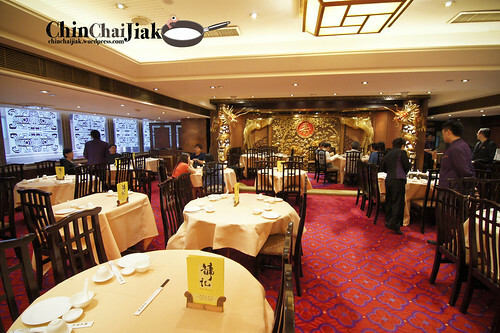 Yat Lok (一樂食館), featured in the Hong Kong Michelin Guide 2011, was given the Bibs Gourmands rating for it’s quality cooking and good value. I need to emphasis that it was Michelin “starred”, as some misunderstood it as Michelin “star”. It was said to be well-received by their locals over Yung Kee and the price is much cheaper too. Coincidentally, Yat Lok is only a couple of minutes walk away from Yung Kee. I initially wanted to order their drum stick noodle but it was “sold out” so i ordered a quarter (bottom) of a goose and it comes with a whole drumstick at HK$140. 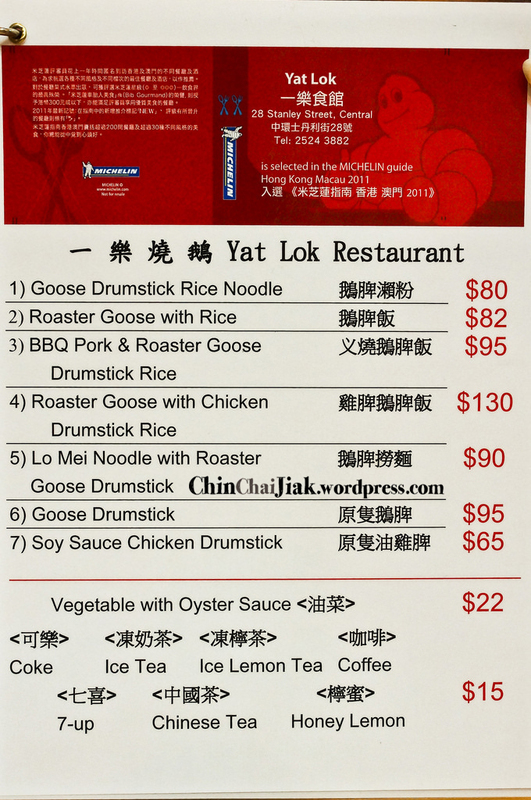 Note that just the drumstick alone cost HK$97. The top quarter is cheaper and cost HK$110. The outlook of the goose is definitely enticing and looks really delectable. The best part of the roast goose? Obviously it’s the skin. The skin is thin and moderately crispy and it’s cushioned by a layer of super melty fat. Have it together with the meat and upon taking a bite, the oil oozes out from the fat and into the succulent meat and it was pure divine. 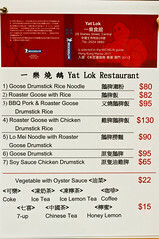 Quarter Goose (with drumstick) at HK$140. Not as cheap as expected. I have to emphasis that i am actually not a big fan of oily roast duck back in Singapore. 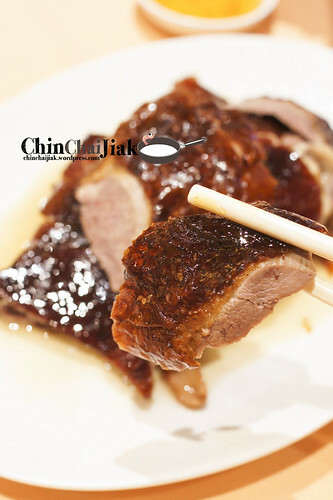 Most of the time, there is a ducky smell that accompanies the fatty portion of the roast duck. However there is no such smell from Yat Lok Roast Goose and i can only taste the fragrance of the fats. Most importantly, it’s oily but not greasy. Can you see the oil on the Goose? Enjoyed every drop of it. When you order a quarter goose, it also comes with their braised sauce. This mega rich sauce is rather salty but it goes perfectly with the roast goose to boost it’s flavour. I thought the noodle don’t really taste good. It’s rather Al Dante and it didn’t really absorb the soup much. The soup is only nice when the goose braised sauce is added into it. Else, there’s nothing special about the noodle. Probably I will order their rice in future. So how does Yat Lok fare against the Year 2012 Yung Kee (cus i heard Yung Kee’s food had deteriorated). Yung Kee’s goose skin is crispier and the braised sauce has more dimensions in taste. On the other hand, i thought Yat Lok’s goose meat is slightly more succulent and fragrance of the goose fat is just lovely. 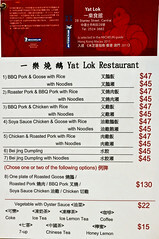 In my opinion, Yung Kee and Yat Lok is comparable in taste, which i think it’s already an accomplishment for Yat Lok. Just basing on the price of the quarter goose alone and comparing apple to apple, Yung Kee cost HK$165 (HK$150 + 10%) while Yat Lok cost HK$110 for the top quarter which is 2/3 of the price. 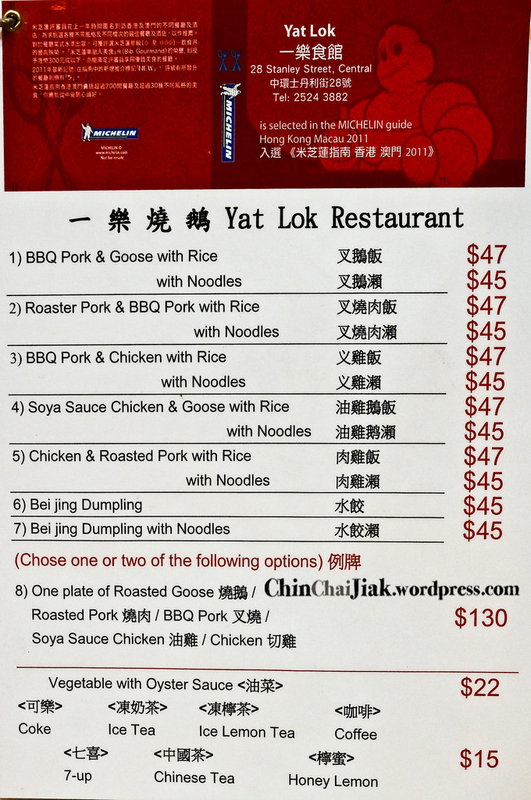 On top of that, for those who wish to enjoy a plate of roast goose rice, it is also available at Yat Lok at HK$49, which Yung Kee only offers the minimum of a quarter goose. Therefore it’s more economical to eat at Yat Lok while it’s more comfortable to dine in a grand and posh restaurant environment with a more complete service in Yung Kee. You may want to just visit both places since it’s in the same vicinity. Just order a quarter goose from Yung Kee and foot the bill. That will save your pocket from burning a hole. There is no need to be embarrassed. Then, pop by Yat Lok and do an instant comparison and let me know your comment K? I wish to hear for you. The small cosy restaurant. It was not that crowded when i visited so my dining experience is quite ok. 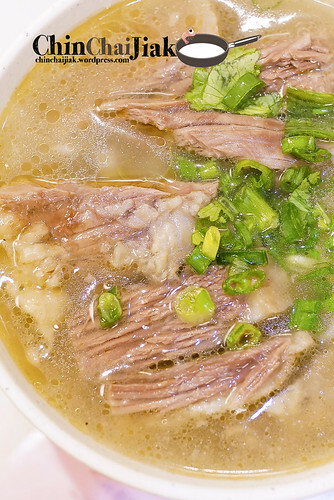 When one think of the best beef brisket noodle in Hong Kong, one will definitely think of Kau Kee. 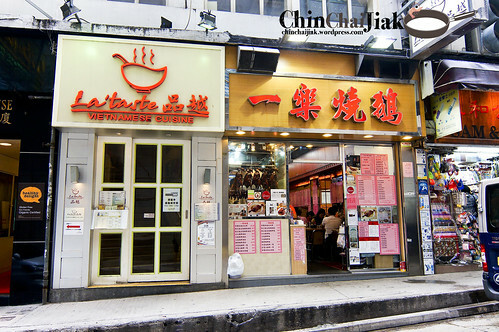 This small little eatery in between Central and Sheung Wan station was said to be Tony Leung’s (梁朝伟) and many Hong Kong celebrities’ favourite Beef Brisket Noodle. 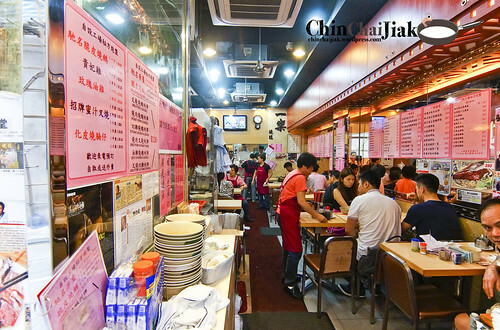 Apart from their food, Kau Kee is also famous for their less-than-passable service. There was one episode where netizen accused Kau Kee’s staff of chasing them out from their eatery. 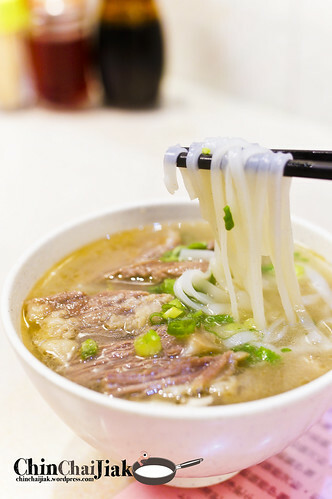 Despite their service, customers still pour in during meal hours just for their Beef Brisket Noodle. 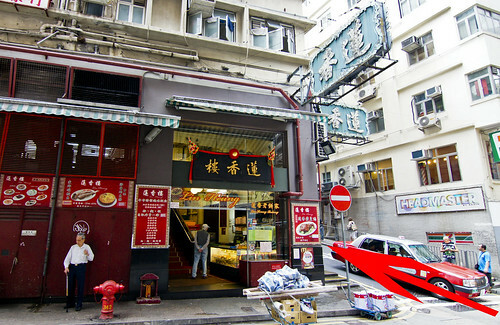 Kau Kee was started by Mr Pan, whose nickname is Ah Kau (阿九, and thus the name 九记牛腩) back in the 1950s. It was only a road-side stall then and it was handed down to Mr Pan’s son 30 years ago, who is the current boss of Kau Kee. The father passed away in Year 1997. 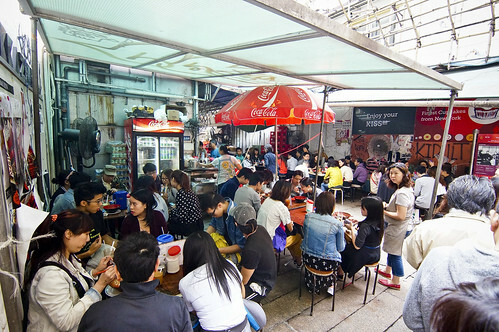 In the same year, Hong Kong government had limited the number of license for such stall and eventually Kau Kee moved to it’s current location. 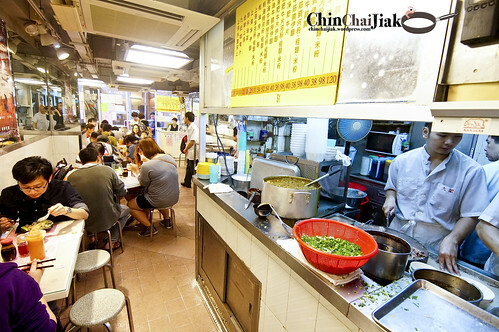 They are most famous for two items – Beef Brisket Kway Teow Soup and their Curry Beef Tendon Noodle. Curry Beef Tendon Noodle seems like a very interesting choice but i ordered their Beef Brisket Kway Teow as i am not so much a fan of tendon. 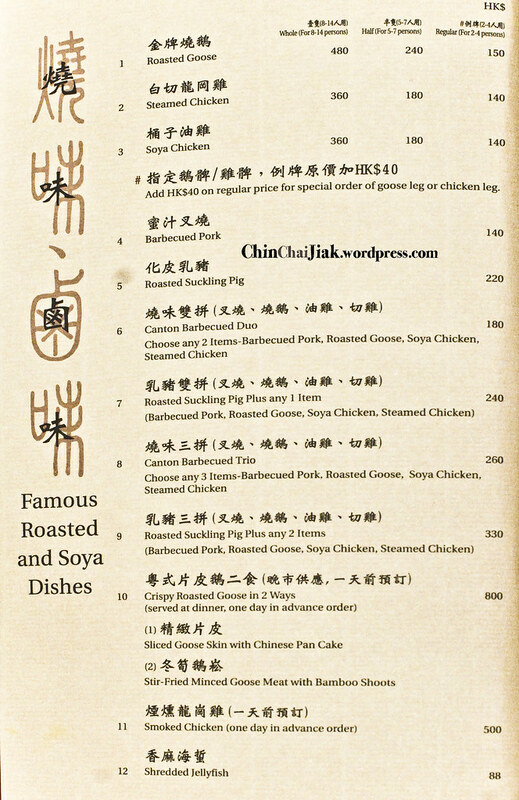 Their limited menu – as of 26 Apr 14. Click to enlarge. Brisket is one of the toughest cut of meat from the lower chest of a cow as those muscle groups support more than 50% of it’s body weight. It would be inedible of it’s cooked like a steak. Therefore brisket is usually cooked for a long period of time to break down the connective tissue and fibre and resulting in very soft and tender meat. Kau Kee had done it perfectly in this sense. Their beef brisket is stewed till the perfect tender soft texture like no others had did before (at least to me). The tissues gave way while the sweet taste of their stew-infused brisket took over the palate. This should be the most tender beef brisket ever. The soup base is rather light, mildly sweet and easy on the stomach. I am enjoying the soup despite already making my food rounds in this area. However, I have to highlight that it does has traces of MSG, which i believe it’s not an astounding discovery. The Kway Teow is really smooth and Kway Teow should be a good choice because it absorbs the clear beef broth easier thus making it more enjoyable. I am glad that i didn’t experience much discomfort from Kau Kee’s service like what the online community mentioned. The staff there seems like an energetic and spontaneous group of people. While I prefer the quality of Kau Kee’s beef brisket over their soup, the beef brisket is definitely enough to lure me back to Kau Kee again. And especially Sheng Heung Yuen tomato noodle is my must-eat for every Hong Kong trip, Kau Kee is literally just next door. There are also rumours of the closure of Kau Kee and I really hope that it will not happen soon else it would really be a big waste. The direction is exactly the same as going to Sheng Heung Yuen as mentioned in my previous post. 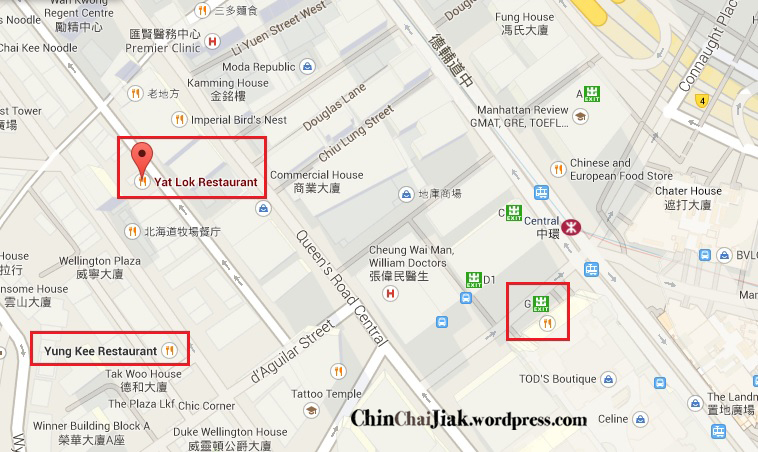 Kau Kee is actually in between Central and Sheung Wan but i always go from Sheung Wan. 1. Come out from Exit E2, cut through the square at Cosco Tower as shown in my maps. The square is easy to identify as it looks like a fountain with steps that lead up to a road. 2. Cross the road and walk towards the left narrow path as shown in my map. You will be going up a gentle slope. 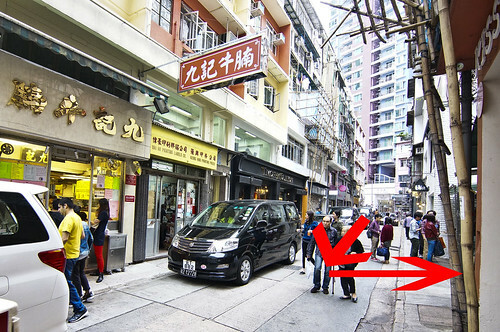 Walk straight until you see this restaurant 莲香楼. 3. This is where you should turn right and head up. There will be steeper slopes and stairs here. 4. While climbing up, don’t forget to look to your right for the signboard of Kau Kee (九记牛腩). This is where you should turn in. 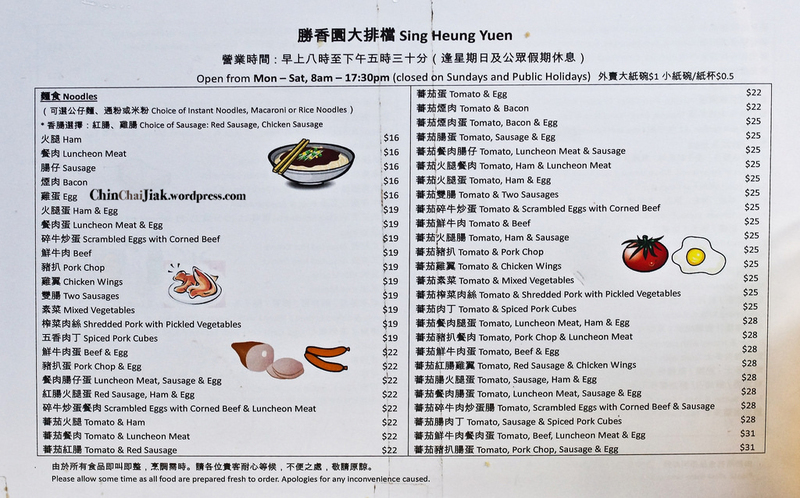 Introducing another of my favourite eatery in Hong Kong – Sing Heung Yuen (胜香园/勝香園). This place is not exactly a cafe but a Dai Pai Dong (大排档). Dai Pai Dong is a kind of open-air food stall that was once very popular in Hong Kong in the older days. It’s directly opposite another famous eatery Kau Kee Beef Brisket Noodle (九记牛腩). 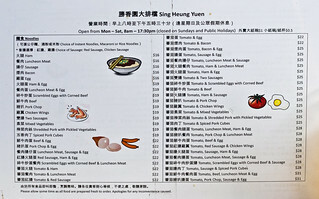 Sing Heung Yuen has a proper kitchen though, but the dining area is a make-shift area built with temporary structure and canvas with no air conditioning. I read from somewhere that such Da Pai Dang is very rare nowadays and there’s only less than 30 such stalls in Hong Kong. 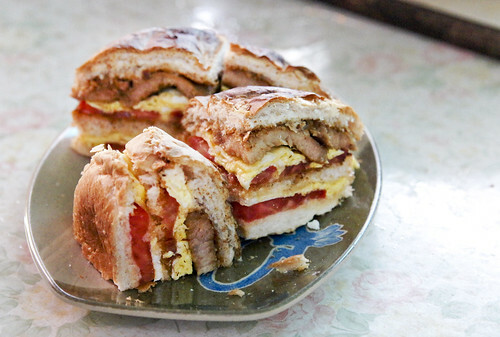 Sing Heung Yuen’s specialties are tomato noodles and their unique crispy toast (condensed milk / pork chop). During meal hours (or even non meal hours on weekend), long queue is formed outside this no frill eatery. 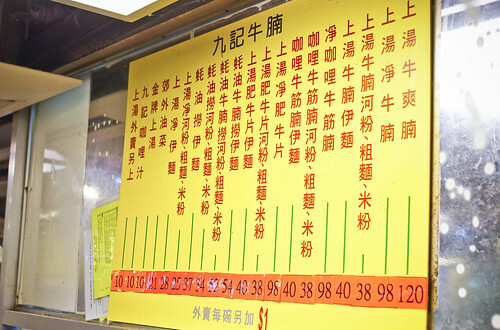 Like a typical Hong Kong cafe, the turnover rate is amazing and therefore the waiting time is not as painful. If you plan to visit Sing Heung Yuen, there is a need to do some leg warming up exercise because there are some steps and slopes to climb. If comfort and tidiness of surrounding is an utmost consideration for an eatery, I think you also can give this place a miss. 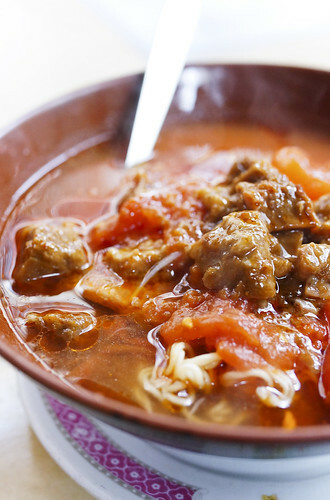 Sing Heung Yuen’s tomato noodle is actually a very simple dish with simple ingredient. 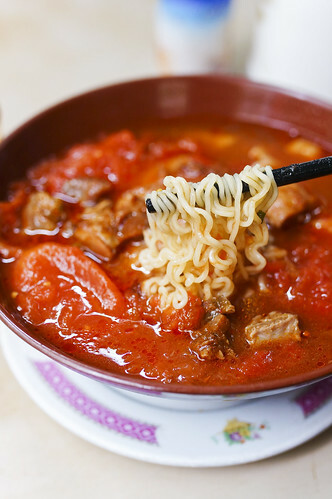 It’s instant noodle, cooked in tomato-base stock while there are 101 combinations of ingredients to choose from. 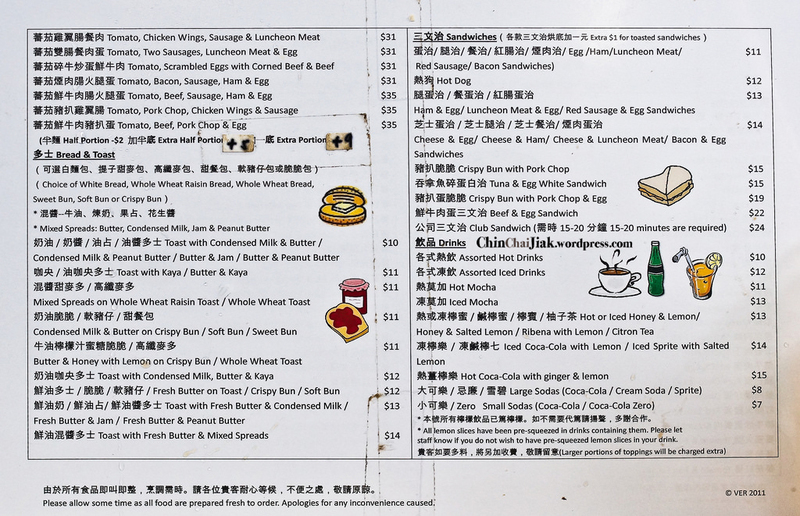 There are choices like sausage, ham, fried egg, canned pork cube, pork chop, luncheon meat, chicken wings, beef etc. On my first visit, i thought that it’s just instant noodle soup cooked in tomatoes but i think i was wrong. Back in Singapore, i tried combinations of instant noodle with fresh tomatoes, canned tomato, tomato puree but i can never get their kind of taste. This made me realised that their soup stock is more than meets the eye. To be honest, i think the soup broth has a tinge of instant noodle seasoning taste, but also cooked in other ingredients that i can’t figure out. 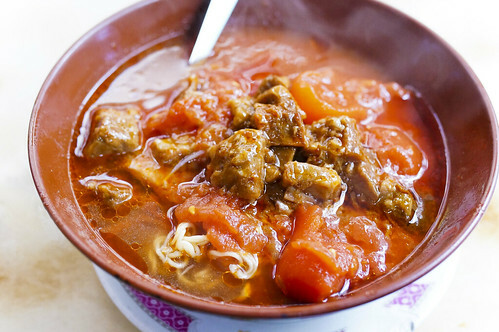 It’s really rich in flavour while it’s scattered with tomato pieces cooked so soft that it almost melts in your month. Unlike some tomato noodles, the tomato taste is not overpowering and i’m still able to taste the sweetness of the broth. I would finish the soup to the last drop on every visit. My favourite combination is the pork cube and luncheon meat tomato noodle (HK$28) as i thought the pork cube gravy compliment the broth pretty perfectly. 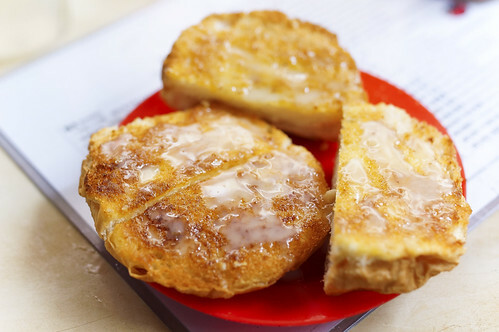 Their Crispy Toast is also my must-order whenever i visit Sing Heung Yuen. Some people said that this is even more worthwhile than the noodle itself. Piglet Bun (猪仔包) is commonly found in Hong Kong cafe and Sing Heung Yuen’s Crispy Toast is similar to a Piglet Bun for it’s outlook, but with an almost completely different texture. 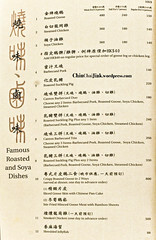 Sing Heung Yuen call their toast as Cui Cui (脆脆) that literally means “crispy crispy”. As the name suggest, the bun is really “crispy crispy”. The bread literally crumbles and crackles when you sink your teeth into the bread. Remember to lean towards the table or it will cause a mess with the bread crumbs falling all over you. No joking. It really does. While the exterior is so crispy, the interior yet remains fluffy and soft. 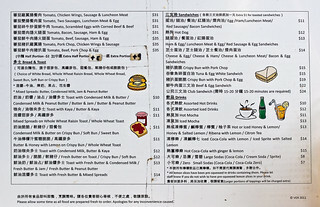 My favourite is their Crispy Bun with Pork Chop and Egg (HK$19). The pork chop is really tender and well-flavoured while it’s paired with fresh tomato slices, fluffy eggs and mayonnaise. It’s easily one of the best pork chop buns that i had in Hong Kong. Their Condensed Milk Cui Cui (HK$10) is a good option if I feel like having something sweet but not overly cloying (aka “gelat”). There’s actually only a thin layer of condensed milk applied onto the butter spreaded toast bread. My friend (who don’t really like instant noodle) once told me that this Tomato Noodle “is just instant noodle” and i don’t think he is 100% wrong. One of the reasons why i visit this place whenever i can is i love the simplicity of the dishes and it feels very home-cooked. I love instant noodle, luncheon meat and pork cubes by the way. I like how they manage to put such simple ingredients together and successfully made it as their signature dish which is well-loved especially by their locals. 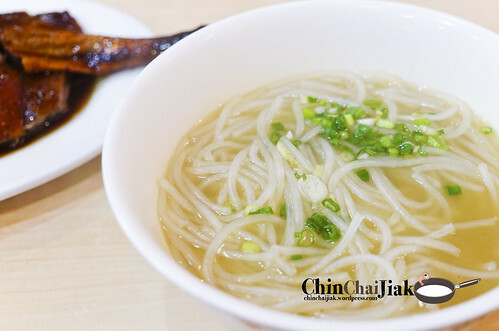 Set your expectation right before making your way down to the most popular eatery at Hong Kong island district to indulge in Hong Kong old school’s dining culture and understand why their local folks love this eatery so much. This place is not exactly easy to find. 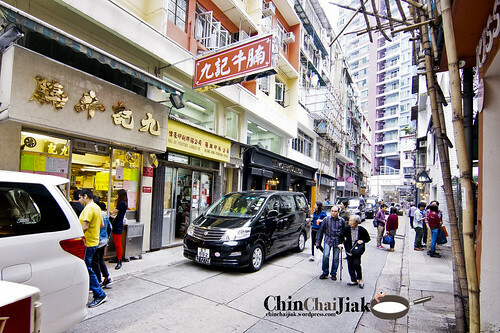 My way to this place is rather straight forward and remember to keep a look out for two rather famous eatery as landmark – 莲香楼 and Kau Kee Beef Brisket Noodle (九记牛腩). 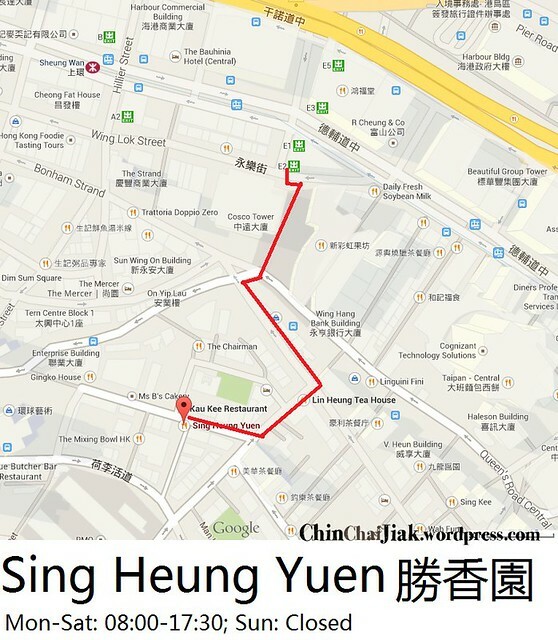 Sing Heung Yuen is actually in between Central and Sheung Wan but i always go from Sheung Wan. 4. 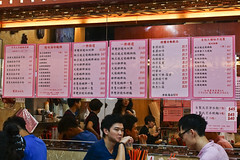 While climbing up, don’t forget to look to your right for the signboard of another eatery 九记牛腩. This is where you should turn in. 5. Walk towards that direction and you will see Sing Heung Yuen on your left.